Cookies are small pieces of text sent by your web browser by a website you visit. A cookie file is stored in your web browser and allows the Website to recognize you and make your next visit easier and the Website more useful to you. Cookies can be "persistent" or "session" cookies. 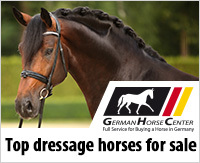 Eurodressage does not use third parties cookies to report usage statistics of the Website, nor do we want the Website to deliver advertisements on and through the Eurodressage, and so on.